Today Gov. Rick Snyder’s panel on radioactive waste, which met in secret last fall, issued its report, clearing the way for Michigan to continue taking radioactive frack sludge and other frack wastes to sites in Belleville and Detroit owned by US Ecology. 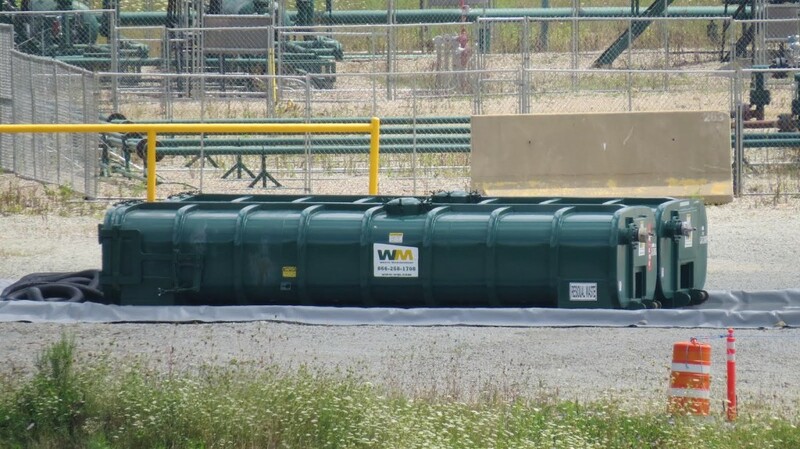 An agreement made by the frack waste company, which operates a Detroit waste processing facility and a processing and Class I landfill facility in Van Buren Township, and the State was to hold off on taking in frack wastes until after the report was issued. That day is here. The Detroit News reported the release of the panel’s paper today: Mich. panel: no changes in handling radioactive sludge. The TENORM panel came about after Ban Michigan Fracking broke the story in August that 36 tons of Pennsylvania radioactive frack sludge, held up for weeks with nowhere to go, were approved for disposal in Michigan by Michigan DEQ officials. The 36 tons of radioactive frack sludge from PA sat here for months and then disappeared. Submitted photo. The 36 tons of radioactive frack sludge in Washington County, PA held for months at a Range Resource waste impoundment site, was what alarmed us and eventually caused Gov Rick Snyder’s kneejerk reaction to create the TENORM panel. The containers of frack sludge were moved off site some time ago and its final deposition is not known at this time. It did not go to a US Ecology facility in Michigan . . . yet. Soon after, the Detroit Free Press blasted the news of the PA radioactive waste on its front page. We and volunteers from Committee to Ban Fracking in Michigan held a vigil waiting for the trucks (that never came) at the landfill/processing facility in Van Buren Township, near Belleville, last August. US Ecology’s top radiology guy, Joe Weismann, came out to greet us, after reading this website from all the way out in Idaho. He came to Michigan to do damage control. . . and presumably at that time made the deal with the governor to quiet things down for a while. Weismann did a dog and pony show type presentation to Van Buren Township residents at a township meeting. He was on the TENORM panel. 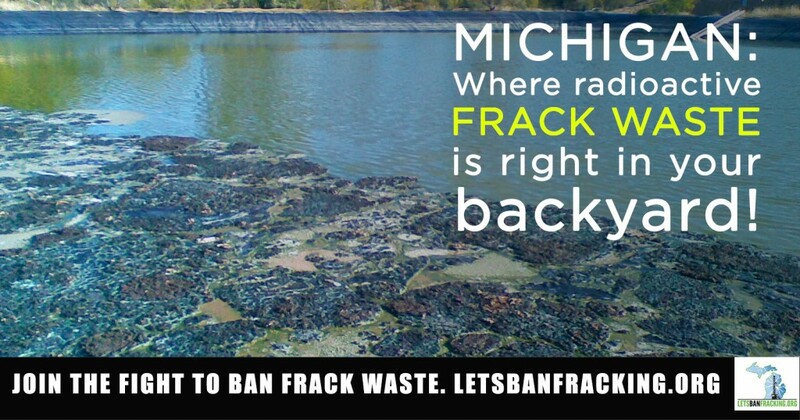 Ban Michigan Fracking did more investigating about the 36 tons of radioactive frack sludge and FOIA’d the DEQ for the tests of its radioactive content. We also learned about the industry’s system of diluting the high radioactive content by simply mixing it up with inert materials, and depositing all of it into the landfill that way. The 36 tons was moved to some undisclosed location in late October. DEQ confirmed with us today that the 36 tons have not yet come to the US Ecology facility in Belleville. 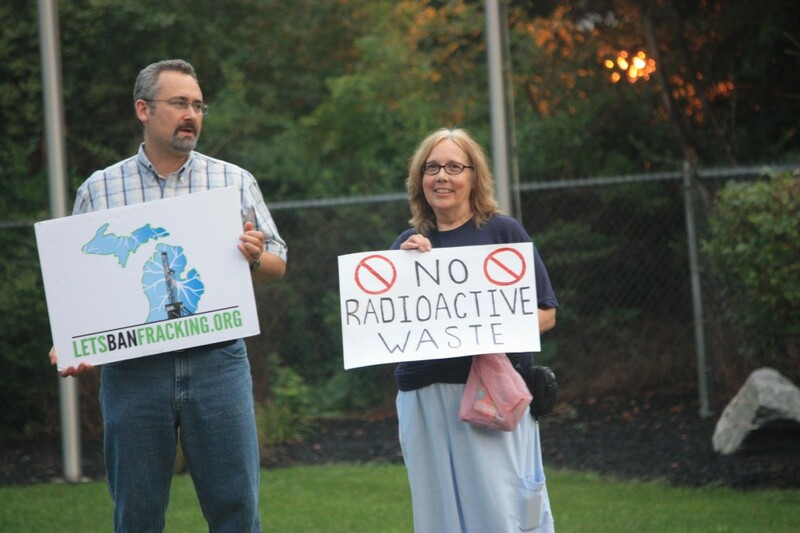 It was also the last request for radioactive frack waste disposal that came to the Michigan DEQ from US Ecology. The Detroit Free Press did a lot more investigating of the Michigan Disposal/Wayne Disposal landfill, too, finding a history of violations, fines and fires. We dug up the records from Pennsylvania as to what’s come to Belleville and found over 20 tons of drill cuttings and about 315 tons of “flowback fracturing sand,” all from Greene County in Pennsylvania’s southwestern edge where the frack industry is ravaging people’s health. The governor’s panel, which evaluated the DEQ’s current system of taking in radioactive wastes and saw virtually nothing wrong with it, (as DEQ spokesperson Brad Wurfel predicted) came up with a handful of recommendations that the state could “consider” changing. Such as shuffling around the placement of radioactive waste within a landfill. It also had a former DEQ staffer as the person “representing the public.” We’ll take a better look at the report in the next weeks and make more comments. And you can too. Michigan DEQ issued a press release that the department will take public comments on the report in a 30-day comment period starting today. Comments can be submitted by email to DEQ-TENORMPublicComments@michigan.gov, or by mail to 525 W. Allegan St., Lansing, MI, 48933. Committee to Ban Fracking in Michigan, the ballot question committee with hundreds of volunteers from around the state, is more resolved than ever to stop these wastes from coming into the state. The Committee is actively pursuing a ballot initiative that for two years now has rallied voters to ban fracking and frack wastes at the next statewide election in 2016. Frack wastes going to facilities in places such as the Belleville landfill, a waste processing facility in Detroit (also owned by US Ecology), and in the hundreds of injection wells and landfills throughout the state, would be banned once the proposal is passed. To volunteer for, and donate to, the ballot initiative, go to www.LetsBanFracking.org. The Michigan DEQ does not keep or provide the public any records on the amounts, types, or locations of frack wastes being generated, emitted, processed, treated, stored, or dumped in the state. Any landfill in Michigan can accept radioactive wastes as long as it’s diluted 50 picocuries/gram with other materials. In December we reported on the 2,200 tons of frack waste from Pennsylvania dumped in Michigan based on Pennsylvania’s Department of Environmental Protection’s database, which tracks the waste. This entry was posted in Uncategorized and tagged ballot initiative, CommitteetoBanFrackinginMichigan, Detroit, Dynecol, frack, frack waste, fracking, hydraulicfracturing, landfill, michigan, Michigan DEQ, naturalgas, radioactive, sludge, Snyder, TENORM, waste, Wayne Disposal by BMF webmaster. Bookmark the permalink.